The EU should focus less on economic relations and more on the worsening democratic conditions in the south-eastern candidate countries. 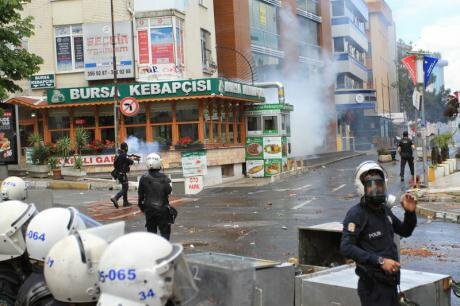 Turkish police fire tear gas on May day protesters, 2014. Demotix/ yenta kurtcebe. All rights reserved.In many potential or actual EU candidate states in south-eastern Europe, rulers with authoritarian tendencies are in power. They increasingly threaten the already weak pluralistic order, political freedoms, and civil liberties in their countries, even if they seem on the surface to comply with formal democratic rules. Nikola Gruevski in Macedonia, Milo Djukanovic in Montenegro, Aleksandar Vucic in Serbia, Recep Tayyip Erdoğan in Turkey, and Milorad Dodik in the Republika Srpska inside Bosnia are the most appropriate examples of this trend. Labeled as democratically elected representatives, these leaders continue to undermine the foundations of substantial democracy. The conditions for fair elections are in most cases not met. Firstly, strong pressure is exerted on the media. It is manipulated in favour of the government parties. Secondly, supporting the government party is a necessary condition to obtaining a job in the public sector. Furthermore, to secure power, government parties distribute public resources as political patronage and follow clientelistic politics in the form of vote buying. Claims of signs of increasing authoritarianism generally and manipulation of independent institutions, loosening boundaries between the judiciary, executive, and legislative branches, and suppression of the opposition and media more specifically have been on the upswing in south-eastern Europe and Turkey in recent years. The EU accession process contributes indirectly to the consolidation of power by the authoritarian leaders in these countries. This does not mean that the EU supports the authoritarian leaders from the Balkans or Turkey; however, the relationship dynamics increase the possibility of the misuse of the EU integration process by those leaders to consolidate their power. In most cases, until they secure power, these rulers present themselves as Europhile and not Eurosceptic. The EU Commission’s Progress Reports lack a nuanced analysis for differentiating between political rhetoric and formal pseudo-democratic institutions on the one hand and the genuine practice of democracy on the other. For example, Macedonia, which is a candidate to join the European Union, faces an escalating political crisis. Prime Minister Nikola Gruevski has accused the chairman of the opposition party Zoran Zaev of being an agent in cooperation with foreign intelligence services and of threatening the constitutional order. Previously, Zaev threatened for months to make a scandal known to the public. He showed a list of names of journalists whom he claims were subjected to wiretapping. This political crisis is a good example of the decline of democracy in Macedonia, in other Balkan countries and also in Turkey. In these countries, a clear pattern of suppression of political opponents and independent journalists is observable. This suppression results in a climate of fear in which critical media and intellectuals become reluctant to criticise their own governments. Hence, the public is forced to be loyal to the government. As for the Turkish case, on 28 June 2012, sixteen EU foreign ministers published a declaration called “The EU and Turkey: Stronger Together,” arguing that Turkey was a secular and democratic country with a growing middle class that can be seen as a model for its neighbors. Quite honestly, these superficial statements gave the impression that the EU focused on the economic side of relations and has neglected the internal dynamics of Turkish politics and the democratic deficits that are becoming ever more serious. The Islamist-conservative Justice and Development Party (AKP), which has been in power for a period of twelve years and will most likely win the general elections in 2015, threatens the principle of the separation of powers by bringing the judiciary, executive, and legislative branches, as well as the media under its control. As the AKP has moved from the periphery to the center of the Turkish political system, using the EU accession process, it has concentrated all the power in its own hands, leaving little room for critical voices. Accordingly, the following question is very critical: To what extent and in what ways does the European accession process contribute to the democratisation of candidate countries? This is a long-standing but still not fully answered question. Centred on the role of party strategies, we should analyse the degree to which ‘Europe’ has been strategically used in connection to state restructuring at the domestic level. Justifying policy positions on domestic state restructuring with reference to the EU accession process makes power accumulation easier in the aforementioned countries. The EU, therefore, should be aware of the strategic use of ‘Europe’ in relation to state restructuring and power gaining mechanisms. The conditions that are necessary and/or sufficient for political parties to adopt such a strategy have been created by the EU’s lack of ‘practical wisdom’. The EU should not overlook the concept of Aristotle’s ‘phronesis’, or ‘practical wisdom’ – the intellectual virtue of recognising and responding to what is important in a given situation – in analysing the current political atmosphere in south-eastern Europe and Turkey and shaping its relations with these countries. The instrumentalisation of EU policies and institutions by domestic actors is not a new phenomenon. Domestic actors seem initially to agree with the conditions of the EU, but do nothing to support them and tend to use them merely as a means to advance their strategic and tactical goals and consolidate their power. In conclusion, therefore, the EU should formulate new criteria for substantial democracy.